A couple formed by Capricorn and Pisces has good levels of compatibility. However, before checking the compatibility, learn a bit more about each of these signs. Capricorn is a sign of the element of Earth and shows a very specific temperament. Pisces belongs to the water signs, and his emotional world makes him a very sensitive person. The marriage of this couple can be quite interesting, because although they are different, these signs complement each other. Capricorn is focused on his personal interests. Pisces spirituality attracts Capricorn, which has great skepticism. The union of Pisces and Capricorn can last a long time. Capricorn and Pisces: how will the relationship work? Earth needs water to nourish itself and balance itself. Different elements like the pair of Capricorn and Pisces will always feel a deep attraction, and this happens because the soul looks intensely for its opposite to make the perfect complement. Pisces with Capricorn represents yin-yang in a perfect balance. When Capricorn has a goal, he perseveres until reaches it. Pisces fights for what he wants, because he immense faith helps him achieve all his goals. Capricorn has his feet on his Earth element. Pisces is adaptable but needs to focus because he lives in a world of constant fantasy, and Capricorn could provide him with tremendous stability. 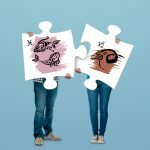 The marriage of the couple formed by Capricorn and Pisces promises to be fairly balanced if they learn from their differences. Capricorn is not a sign great in communication. However, he might be able to open up with his partner Pisces. For communication to flow between the two of them, they must work hard because they will have many problems. Capricorn has a rather pessimistic temperament. Pisces can help him increase his energy and optimism by pulling him to his mystical side. Capricorn is very conservative and may feel a bit uncomfortable with the informality of Pisces. Work together on your strengths and weaknesses so you can overcome the differences if love is actually true. Pisces enjoys the intimacy of his fantasies with his partner. Capricorn is very realistic and methodical. Pisces can fill this with love and magic for Capricorn, and break their traditional structures. This couple of Pisces and Capricorn will have to learn to achieve balance in their sexuality. Capricorn’s boredom will be eclipsed by the reverie of Pisces, who is always willing to invent new ways of fantasizing in privacy in order to please his partner.